Finally finding time to sit down and write out the birth story of little Luke! 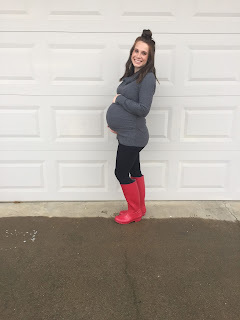 Warning: my birth story posts are ALWAYS long because I love looking back at the details. I dropped the kids off at Grandma's and headed to my appointment. At my previous appointment I had been 3cm and "thin." I was hoping to have made some progress but I was still 3cm and 30% effaced. I asked the doctor to strip my membranes (it put me into labor within days with both Phillip & Zoe) so she did and then told me "well I'm on call tonight but Dr. Rooney is on call Thursday which is when I think you'll deliver so you'll have her at your delivery." I was surprised she was picking an actual date to estimate when I'd deliver and I totally wasn't buying it! 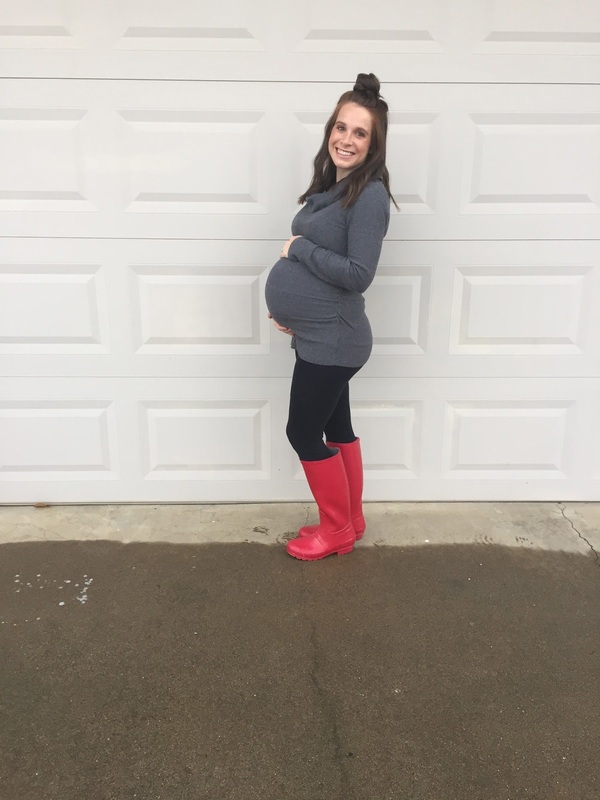 I felt like I might deliver early just because I'd had Zo so early but I was definitely not as confident as my doctor that I'd be delivering that week, especially not in two days! When I had my membranes stripped with Phillip & Zoe I went into labor 4-5 days later so I expected about the same this time around (if the membrane strip worked). As I walked out of the office and to my car I suddenly felt very overwhelmed at the thought of possibly delivering the baby so soon. I had never before during the pregnancy felt worried at the thought of having 4 young children but then it just suddenly hit me and it seemed so real and it was so, SO overwhelming! I started wishing I hadn't asked the doctor to strip my membranes haha! I started mentally going through my pre-baby to-do list and the one thing that kept screaming at me was that I hadn't finished (or started!) Luke's baby quilt. It actually wasn't even on my short list of things to do before he arrived but all of a sudden I felt so anxious over the fact that it wasn't done. I called my sister and told her about my appointment and told her how I was suddenly feeling so overwhelmed and not at all ready. I told her how anxious I was over Luke's quilt not being done and told her I determined I would just work on it all day/night until it was done! As soon as we hung up I just lost it and started bawling haha! HORMONES. I cried almost the whole way back to pick up the kids. I cried over the fact that I felt so unprepared to be a mom to FOUR kids (all under age 5) and I cried because Zoe wasn't going to be my baby anymore (it's always bittersweet when your baby is going to be a big sibling). As soon as I saw Zoe I almost burst into tears again but I somehow held it together ha. I was so serious about starting/finishing the quilt that day so as soon as I got the little two down for naps I pulled out the fabric (all I had done was wash/iron the fabric I'd chosen) and got cutting. I cut, laid out and started sewing the pieces and kept at it ALL afternoon. I had been so, so good at keeping the house SPOTLESS so I could leave at any minute and not worry about leaving a messy house. Everything was in its place all the time which basically meant I followed the kids around all day long picking up their messes ha. It's a full-time job, I kid you not! BUT on this day since I was so intent on finishing the quilt I basically ignored everything else. The kids entertain themselves really well but they make HUGE messes. So the playroom was a disaster, Zoe had emptied so many cupboards/drawers and dragged items all through the house, etc etc etc. My house was basically a disaster but I turned a blind eye to get the dang quilt done. Tom wanted to go to an emergency preparedness meeting at the church that night and told me so at dinner. I wasn't thrilled about going because THE QUILT (!!) but we went anyway...and decided to walk. MISTAKE. Haha the baby had been sitting so low the last couple weeks and literally every step caused the sharpest pains! I was dying on the walk over! Anyway, the thing lasted about an hour then we walked home and while Tom put the kids to bed I ran to Walmart to get batting and more thread for my quilt. As soon as I got home (around 9pm) I got back to work on the quilt. Literally felt like I was sewing my life away ha. Tuesday at 9:02pm, I texted my sisters: "K here is my plan. If at all possible finish quilt tonight. Tomorrow do ANYTHING else to prep for baby! Then I can be ready on Thursday just in case." As I was securing the batting to the quilt (probably around 11pm) I had a contraction that was so minor that I wasn't even really totally sure that it was a contraction haha. 5 minutes later I had another one. 5 minutes later I had another one. 5 minutes later I had another one. You get the point. I honestly at this point didn't really think much of it because they were so, so mild. 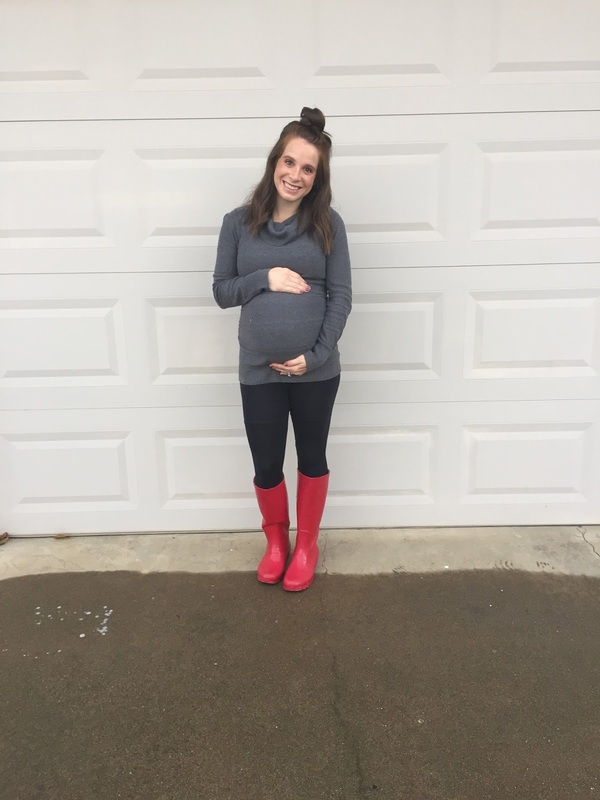 However, I knew that since I had had my membranes stripped there was a good possibility of going into labor soon and because I was already extremely overwhelmed from my doctor appointment, I wanted Tom to give me a Priesthood blessing before the baby came. At the start of contractions I asked for one before he went to bed and I warned him that I was having mild contractions and we maybe would need to go to the hospital later. At 11:31 I texted my sisters again: "Having contractions 4-5 minutes apart. They're not that painful so I'm going to see if they keep up or what they turn into..."
11:46: "Trying to HURRY THE HECK UP with this quilt!!" At midnight I told my sisters I just needed two more hours to finish the quilt but I didn't think I would get that much time before needing to head to the hospital. And then I whined about how for the first time in over a week the house wasn't spotless haha. 12:13 - "I actually think this is going to be it guys!!" 12:15 - When asked how painful my contractions were, I told my sister they were "manageable" and rated them 4/10 on the pain scale. 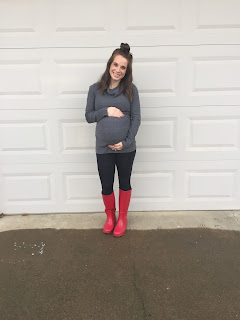 With Zoe, it got to the point that I was on my hands and knees to get through contractions before I headed to the hospital and at this point, I was still sewing through contractions so I knew we still had plenty of time. 12:45 - Still having consistent contractions. Feeling pretty convinced I'll be having a baby sometime today. Kelli told me to make sure I called my parents in time so my dad could come over to watch the kids before I really had to leave. I told her I was just trying so hard to finish the quilt first haha! 1:24 - Texted my sisters and said I decided to put the quilt away for a minute to pack my bag. Kelli asked me if Tom was excited and I told her he was asleep HAHA. Yeah, he had no idea I was pretty close to having a baby. 1:38 - Still just timing contractions. I packed my bag, cleaned the house up, did my makeup and decided to sit down to the quilt again for a few minutes. I had texted the birth photographer at the first contraction and couldn't decide when to call her. Somewhere in all of this, I called my mom and explained my contractions and wanted her opinion of when I should go in. You'd think being on my 4th kid I would kind of know but NOPE. Granted this was only the second time I spontaneously went into labor (induced with Jack, water broke with Phillip but I never started contracting on my own). 1:58 - Texted "I think Heavenly Father is letting me finish the quilt." hahaha, guys, I really was so determined. Told my sisters "it would be so sucky if you guys are up all night and this isn't even the real thing! I mean I really doubt it's not. I've never had consistent contractions like this except for when I was in labor sooo..." At this point, I had just finished the body of the quilt and only had the edging left! Between 2am and 2:16am I frantically tried to pin all my edging but right after I started pinning it the contractions were suddenly much harder. I was already on my hands and knees pinning the quilt on the ground but I had to stop during contractions and really concentrate on getting through them. By this point I probably sounded like a sad puppy during contractions because they were so painful haha. I finally had to admit that I probably was NOT going to finish the quilt. 2:16am - Texted my sisters "Darn so close but time to go." 2:30am - Dad arrived to stay with sleeping kids while we went to the hospital. I estimated I was 5cm judging by my pain. 2:41am - Texted my sisters saying "Oh boy. Okay yep we're gonna have a baby. These contractions man!!" 2:45am - "These got painful fast!!" Left for the hospital. 2:52am - Had called my birth photographer 6x, texted multiple times and Instagram messaged her. No answer/no response. Told my sisters I thought she was going to miss the birth. Arrived at the hospital around 3am and I could not wait to get to triage. I wanted an epidural pronto. There is valet parking at L&D (amazing!!) so we were able to get out right at the front doors. I couldn't even make it the few steps to the door though and had to hang out by the car through my next contraction. In the elevator I told Tom he had better call his mom and tell her to come because I felt pretty close (next time I'll know that when I feel "close" I still probably have a few hours haha!). A nurse took me to my room then and I was miserable on the way there trying to get through contractions. Once we got to the room I just knelt in front of the bed and tried to work through the contractions. The nurse applied pressure to my hips and back during contractions and I couldn't believe how much it helped. Still wanted that dang epidural haha. Had a horrible experience with my IV (I think I've only had a good IV once in 4 babies and 2 surgeries). My nurse was kind of awful so it's a good thing I had done this 3 times already and knew the ropes haha. 4:05am - Epidural in and I was SO happy. The epidural insertion experience in and of itself wasn't the greatest ever but not awful either. I could tell he was having a hard time though and it took awhile which was really hard because staying completely still through contractions is not easy and completely miserable. Afterward he asked me if I've ever been told I have minor scoliosis (uhhh...no?) and he had Tom come around and look at my spine and he showed him where it "curved." Tom couldn't tell and wasn't thrilled at the idea of having to see the epidural haha, he hates that stuff! He wishes he could leave the room while I have it inserted but I won't let him haha!! My mom and Tom's mom were both at the hospital by this point and we were all just waiting for a baby! Got checked around 4:45am and had gone from a 5 to a 7/8 in one hour so they called the doctor for her to head over. Was feeling lightheaded but loving not feeling contractions. Had called my photographer close to 20x by this point (literally spent most of the hospital labor trying to reach her) and finally decided to give up. My doctor arrived at the hospital around 5:45am, checked me at a 9, broke my water and said we should be pushing in about an hour. 6:24am - My doctor was planning to come back in to check me around 6:45 but I was feeling the urge to push so the nurse called her in. I was complete so...push time!! Of course they had to bring all the nurses in and get everything ready and everything so we didn't really start pushing until after 6:40. This is literally probably one minute before pushing haha. Epidurals are amazing. Before we started pushing I told my doctor (who didn't get to deliver me last time since she wasn't on call - still loved Dr. Hiuga who ended up delivering Zoe and - fun fact! - was the doctor who actually delivered ME when I was born haha!) that when I gave birth to Zoe I didn't tear or need an episiotomy and I'd really like to do that again haha. The difference in recovery is AMAZING when you don't tear or need an episiotomy. We had a great little chat and she told me I was going to push at about 80% so she could have the baby come out slowly to reduce the chance of tearing. I kid you not, I will never get over what an amazing delivery experience I had with Luke. It felt like it was just me and Dr. Finegan in the room during the recovery. It was so quiet and she was just speaking so calmly/softly to me telling me when to push, how hard to push, etc and I just felt so calm the entire delivery. She talked me through the whole thing and normally I feel like it's the nurse who is really talking me through it and the doctor is just down there catching the baby when it comes out! This time though I really felt like my doctor was so in tune with me and we worked as a team to get the baby out easily. His shoulders ended up getting stuck a little and I had to push extra hard to get those out (my doctor later told me she heard a "pop" when I delivered his shoulders and she told the nurse to have the ped check it out for dislocation but the ped later said he looked fine!) but it was easily my best delivery experience to date. No tearing (woohoo!) and he was fully delivered in like 3 or 4 pushes. It was so fast and SO easy and it seemed so surreal. Like once he was out I just felt like "did that really just happen?!" They immediately put the baby on my chest and we were just in heaven. Welcoming a brand new baby is such a special experience. Luke Davis Wallace arrived at 6:46am. My birth photographer did in fact miss the birth but my mom captured some great images on the fly with my phone and I'm so grateful. Two weeks early, 7lb10oz and 20.5" long. I am so grateful for Dr. Finegan and how great of an experience she helped this delivery to be! Phillip & Zoe's deliveries were easy too (don't get me started on Jack's - it was a nightmare!) but this one...I mean, I want to go back and do it again haha! I feel like the best way to describe it is it was like going to tea time with my doctor hahaha! That easy. Such a perfect birth experience and such a perfect little boy.